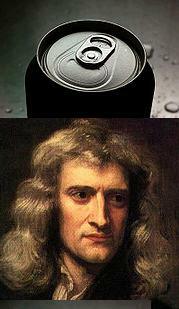 Above is a "can" and "Sir Isaac Newton". If you put the two together you get "Can-Sir-Isaac Newton". Or for short - "can-sir". Also spelt cancer. Oncology is the speciality devoted to dealing with cancer. With almost all cancer, the ideal treatment is surgical removal. This is because if every tiny bit of the cancerous material is removed, it cannot recur. Aside from this, the other two main treatments are radiotherapy and chemotherapy. Whilst less ideal than surgery, many patients experience full remission from this treatment. Some courses of treatment are assisted with drugs that have antimetabolite or hormone targeting effects. Since, on average, 50% of patients with cancer will eventually die of their disease, the final aspect of cancer management is palliative care. This page was last modified on 19 March 2011, at 12:26.